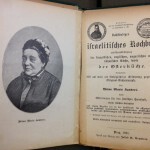 Heim des Jüdischen Frauenbundes Neu-Isenburg. 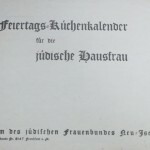 Feiertags-Küchenkalender für die jüdische Hausfrau. c. 1910. 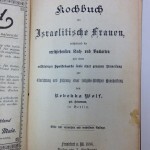 As described in this Holiday Cookbook for Jewish Women, the Home of the Jewish Women’s League in Neu-Isenburg was a safe haven for pregnant women and mothers, children (legitimate and illegitimate), and displaced young women; it offered these women education and training in a traditional Jewish environment and family-like setting. 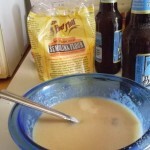 This recipe for “Weißbiersuppe mit Gries” (wheat or white beer soup with semolina) is from from the ninth edition of Rebekka Wolf’s Kochbuch für israelitische Frauen is a good way to get rid of unfinished beer, but there are no instructions for how to get rid of left-over beer soup. Gumprich’s stuffed chicken recipe is probably my favorite of all the dishes I have prepared using cookbooks from the LBI collections. 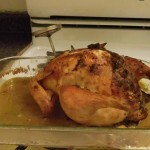 I liked it; my guests liked it; my cat went nuts when I took the chicken out of the oven and lunged for a piece. 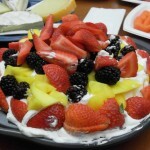 The best part about this dish was that it was very easy to prepare. 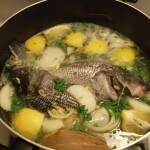 It required only a few ingredients and little preparation. Although Wolf’s cookbook offered housewives the opportunity to surprise guests and family with “einem fremdartigen Gerichte” (an exotic dish), what was really special about this “Cookbook for Jewish Women” may have been its emphasis on Jewish customs. Over at least 10 editions, this juggernaut cookbook was expanded into a compendium of housekeeping tips, notes on Jewish practice in the home, and even first aid remedies. Gumprich, Bertha. Vollständiges Praktisches Kochbuch für die jüdische Küche. 1896. Gumprich’s “Complete, Practical Cookbook” was a resource for inexperienced housewives trying to prepare affordable meals that were both tasty and kosher. 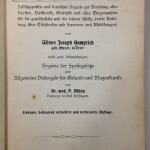 As Gumprich writes in her introduction, many cookbooks in the 19th century did not provide guidelines for kosher cooking methods and ingredients; or they weren’t practical for “die einfach bürgerliche Küche” (the simple middle class kitchen). 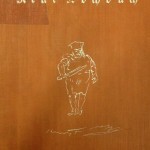 What sets Kauders’ cookbooks apart from many others was her emphasis on cooking as an artform. In the introduction to her Vollständiges Kochbuch she compares cooks to sculptors who create monuments out of raw materials. 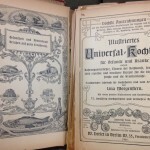 Lina Morgenstern developed her “illustrated, universal cookbook for healthy and sick persons” using the latest nutritional theories of renowned doctors, thus offering a fascinating glimpse into early 20th-century concepts of food as medicine.